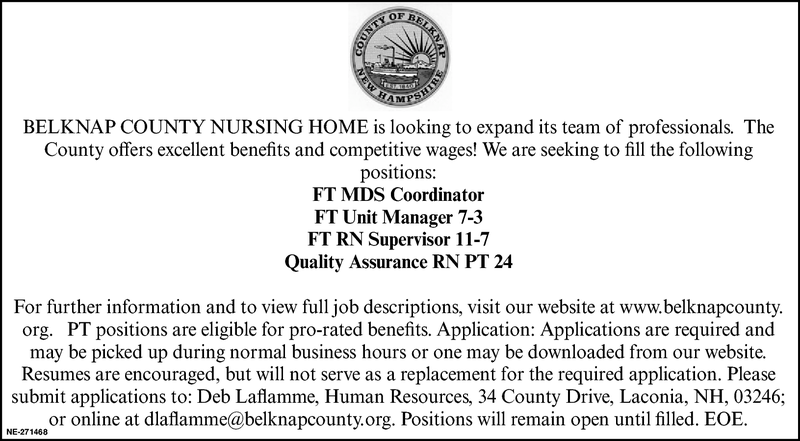 For further information and to view full job descriptions, visit our website at www.belknapcounty. org. PT positions are eligible for pro-rated benefits. Application: Applications are required and may be picked up during normal business hours or one may be downloaded from our website. Resumes are encouraged, but will not serve as a replacement for the required application. Please submit applications to: Deb Laflamme, Human Resources, 34 County Drive, Laconia, NH, 03246; or online at dlaflamme@belknapcounty.org. Positions will remain open until filled. EOE.